The Herne Hill Baptist Church opens its doors on bank holiday Monday for this beautifully animated fantasy film that will appeal to adults and children alike. Japan’s Studio Ghibli collaborates with Dutch animator, Michael Dudok de Wit, and French co-writer, Pascale Ferran, bringing us an East-meets-West storytelling of a shipwrecked mariner on a deserted island. A 2016 Cannes Film Festival winner, it was also nominated this year for Best Animated Feature at the Academy Awards. An unnamed antihero battles then submits to a storm and survives this brutal yet lush island, teeming with life and the beauty and ravages of nature. But his desperate attempts to escape the island and his loneliness are relentlessly thwarted by a mysterious giant female red turtle; the mariner is trapped in this Eden-like prison. Beautifully told in Ghibli’s signature style but without words, it speaks profoundly to us all. 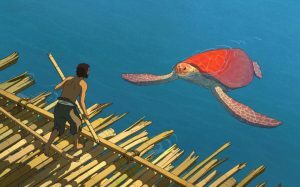 The Red Turtle is about an awareness of, a respect for, and an acceptance of nature and our environment. As part of this year’s Herne Hill Free Film Festival we are excited to be partnering with the Norwood and Brixton Food Bank, helping to raise awareness for this most worthy of local causes. We will be collecting food donations and spare change at each of our screenings so, if you can, any food or money that you can spare would be greatly appreciated to help this wonderful charity continue the admirable work they do in the local area. We will be tweeting information about urgently needed items so stay tuned on Twitter to @HerneHillFilm.